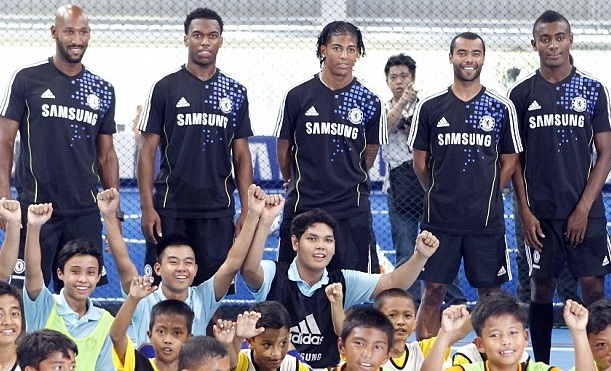 Chelsea are back in Kuala Lumpur and earlier today, five players - Ashley Cole, Nicolas Anelka, Salomon Kalou, Daniel Sturridge and Patrick van Aanholt - visited a community project on the outskirts of Kuala Lumpur; an artificial pitch funded by the club. 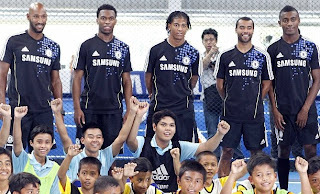 Chelsea were in Malaysia in 2008, and the papers have stirring memories of a famous home win. Coach Ong Keim Swee will select a makeshift team from players in the Malaysia Super League to play Chelsea under an All Stars banner but Malaysia's national team are busy preparing for a World Cup qualifier in Singapore on Saturday. It will be a weaker team than faced Liverpool and Arsenal and no-one holds out much hope in the World Cup campaign either. Chelsea have been busy since their arrival on Monday with signing session, meet-and-greets and a public training in the national stadium which attracted about 15,000 supporters. Andre Villas-Boas has been putting them through two sessions a day, one early in the morning before the heat and humidity rises, and one in the evening, when it starts to cool slightly.